Selenite lamps are produced from a naturally clear or opaque form of gypsum crystal. Light passes through it easily, creating a warming glow. The selenite, in its natural form, has been hollowed out to create a unique lamp, and the tower effect is achieved by splitting and chipping along natural cleavage surface. What is selenite crystal used for and what are it's benefits? Due to its powerful metaphysical properties and ability to charge itself, selenite is one of the most popular crystals used to cleanse and recharge other crystals. Recharging and cleansing rid your crystals of any negative or unwanted energies that can build up over time. The name of the Selenite lamp comes from the name of Greek Goddess by the name of Selene, a moon goddess. It normally comes in white, although there are other colors specific to certain regions (Green Selenite in Australia). The crystal corresponds to the Crown chakra and can help clear away any negative energy, and is also the stone for mental clarity. 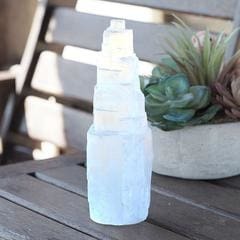 If you are feeling confused or down from the haste and stress of everyday life, this crystal lamp can help you find your sense of calm and peace within yourself. Selenite lamps are renowned for their cleansing and healing abilities, and can help to clear negative energy both from our chakras and the surrounding environment. Selenite also has calming properties which makes it ideal for meditation or spiritual work. When you first see selenite, its white color will instantly grab your attention. This color is just perfect for a stone that stands for mental clarity. You will need selenite crystals when there are a lot of things going on in your head and it’s starting to affect your sense of peace and quiet. It’s a good stone to have to help you quiet your mind and give you mental clarity. It’s also a good stone to have with you to protect you from any form of psychic attack. People have a way of filling your head with bad ideas, thoughts, and perceptions. You must not get your selenite wet as it may dissolve in water.